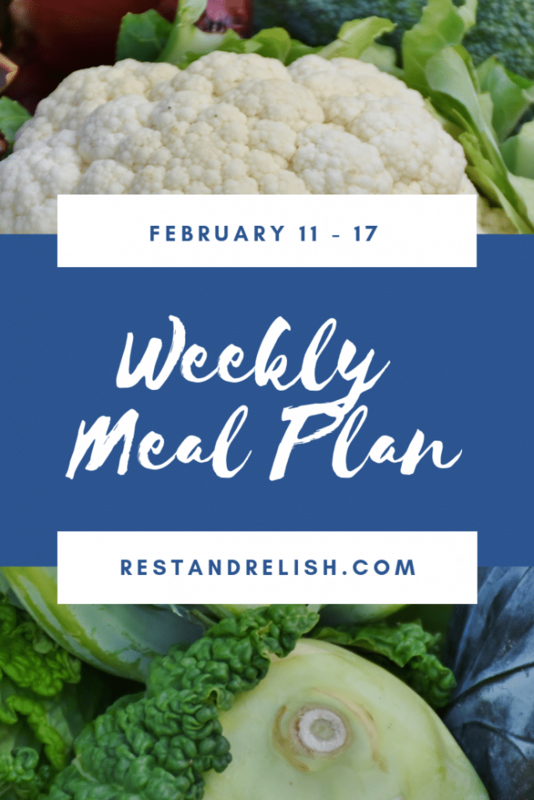 Rest & Relish Weekly Meal Plan – February 11 – 17, 2019 includes six easy vegetarian or pescatarian dinners with simple substitutions for vegan and gluten-free diets. This week’s Rest & Relish Weekly Meal Plan includes two vegetarian options, a vegan meal, two pescatarian ideas and a Sunday dinner with meat if desired. Modifications are also listed to make most meals gluten- or dairy-free. As usual, feel free to swap the days or items around based upon your weekly schedule. Bon Appetit’s recipe for cauliflower “bolognese” is packed with vegetables and flavor. If you have cauliflower and mushrooms in the fridge, then you can probably pull this together easily this week. Gluten-Free Adaptation: Use lentil or quinoa pasta instead of traditional rigatoni. Grilled shrimp on corn tortillas with shredded cabbage and fruity salsa = easy and healthy dinner! I marinate the shrimp for about 15 minutes with my homemade spice blend, lime juice and oil. Grill the shrimp for 2-3 minutes per side or until opaque pink. Fill your tacos and serve! Adaptations: Feel free to swap the corn for flour tortillas and the shrimp for grilled chicken. Stir-fry is a go-to quick and healthy weeknight meal. Mix and match your veggies, choose your favorite protein, and add some spices and flavor. Heat sesame and peanut oil in a wok. Add minced garlic and ginger, as well as chopped onions and chili pepper to the pan to cook for several minutes. Add tofu to cook for approximately five minutes. Remove tofu from pan and keep warm. Add bok choy and water to pan to cook until greens are wilted. Toss tofu and cooked vegetables together in wok. Serve topped with rice vinegar for additional flavor. I’ve been making a version of my late Grandma’s salmon cakes since I was a young newlywed. If you use canned salmon, it’s a cheap way to get those healthy omega-3’s in your diet. Would you like me to share this recipe soon? If so, let me know in the comments! I previously mentioned that this recipe would be out on the blog soon, but I promise it’s coming this week! A sick kid and some other life stuff took precedence, but this post is almost complete. Perfect for a cold, end of week meal! Chicken and Vegetable Pot Pie. Our son loves comfort food….chicken pot pie, macaroni and cheese, mashed potatoes…..all things I don’t cook regularly! He requested chicken pot pie this week, so I’ll work on this for Sunday. I’ll prepare a smaller one without chicken for myself and double the vegetables. I hope this Rest & Relish Weekly Meal Plan is helpful to you. What looks good to you this week? Please pin our meal plan to Pinterest for your reference and tag @restandrelish on Instagram and Facebook if you make any of our recipes! Follow us on Instagram, Pinterest and Facebook and sign up for the mailing list to receive great recipes and meal plans each week!